"I MASNADIERI (The Bandits or The Robbers) is an opera in four acts by Giuseppe Verdi to an Italian libretto by Andrea Maffei. As Verdi became more successful in Italy, he began to receive offers from other opera houses outside the country. The London impresario Benjamin Lumley had presented ERNANI in 1845 and, as a result of its success, commissioned an opera from the composer which became I MASNADIERI. It was given its first performance at Her Majesty's Theatre on 22 July 1847 with Verdi conducting the first two performances. While reasonably successful there and in Italy up to the mid-1860s, the opera disappeared for about 90 years until revived in 1951. It has been revived from time to time in the 21st century. The opera has not been frequently performed, although it has been given more frequently in recent times, as evidenced by recordings of many live staged or concert performances over the last fifty or more years; this indicates something of a growing interest in this opera. 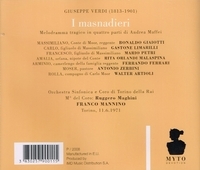 For instance, there was a broadcast performance on 29 March 1951 in Italy with the RAI Orchestra and a staging as part of the 1969 Maggio Musicale Fiorentino in Florence, followed shortly thereafter by a 1971 performance broadcast on 11 June 1971 in Italy and given by the Orchestra and Chorus of RAI Torino." “Bonaldo Giaiotti became a fixture at the Metropolitan Opera, where he sang more than 400 performances from 1960 to 1989, mainly in Italian operas. He also performed in other major houses, including the Vienna State Opera, the Royal Opera House in London, the Teatro Real in Madrid and the Zurich Opera. He was a special favorite at the Arena di Verona, where he appeared for more than 30 seasons. Oddly, Mr. Giaiotti did not make his debut at La Scala until 1986, probably because of all the time he spent in New York earlier in his career. But he did make a notable Italian debut in 1973, when he appeared in Verdi’s I VESPRI SICILIANI to open the Teatro Regio in Turin in a production directed by Maria Callas. Mr. Giaiotti performed stalwart duty at the Met at a time when both the Met and its Lincoln Center neighbor, New York City Opera, served up a cornucopia of great basses, among them Cesare Siepi, Jerome Hines, Nicolai Ghiaurov and Samuel Ramey. While Mr. Giaiotti may have been outshone by the big names of his generation, keen opera observers knew his value. In 1974, the critic Peter G. Davis, writing in THE NEW YORK TIMES, called him ‘outstanding’ in his two arias on an RCA recording of Halévy’s LA JUIVE, numbers that ‘almost every ‘golden age bass of any consequence recorded. I can’t think of many other contemporary singers in his range who possess such columnar solidity over two full octaves’, Mr. Davis wrote. ‘Giaiotti inflects the words with real majesty’. No matter the assignment, Robert Lombardo, a former manager, said by email, Mr. Giaiotti stood out for his ‘consistency and class’, both stylistically and vocally. Mr. Giaiotti was a basso cantante, according to the classification of vocal connoisseurs. That is, his voice was lighter and more agile than a basso profondo. Critics described his voice as resonant, firm, sonorous and rock-solid. …in 1958 Mr. Giaiotti made his professional debut as Colline. He did so well that he was encouraged to enter a singing competition, which eventually led to an artists’ exchange between the Cincinnati Summer Opera and Italian companies. He made his American debut in Cincinnati as Don Basilio in THE BARBER OF SEVILLE. But it was an encounter in Milan that sealed his American career. Rudolf Bing, the Met’s imperial general manager, was returning from a vacation in the Dolomite mountains in Italy when he stopped off in Milan to discover new voices, as he regularly did. He heard Mr. Giaiotti and hired him for the 1960-61 season, slotting him to make his debut as Zaccaria in Verdi’s NABUCCO on the season’s opening night - the first time the Met had put on that opera. Mr. Giaiotti went on to sing 29 roles in 28 operas at the house. Early in his career, Mr. Giaiotti’s gift for mimicry helped him, because he could imitate other singers. But an insecure technique led to an early crisis in his singing – ‘a serious vocal collapse’, as Mr. Hines put it in his book. Unlike many singers, who often keep vocal distress private, Mr. Giaiotti did not hesitate to seek help. Rita Orlandi-Malaspina is an Italian operatic soprano who had a major international career from the 1960s through the 1980s. She drew particular acclaim for her portrayals of Verdi heroines. She has also had a successful career as a concert soprano, particularly in performance of Verdi's REQUIEM and Ludwig van Beethoven's Symphony #9. She is married to bass Massimiliano Malaspina who also has an important opera career. Prior to her marriage she performed under the name Rita Orlandi. Born in Bologna, Orlandi-Malaspina was a student of soprano and voice teacher Carmen Melis in Milan. She made her professional stage debut in Milan in 1963 at the Teatro Nuovo as Giovanna in Verdi's GIOVANNA D'ARCO. She quickly became a major figure in Italy's most important opera houses during the 1960s. Orlandi-Malaspina enjoyed a particularly fruitful partnership with La Scala, where she made her debut on 29 April 1966 as Leonora in Verdi's LA FORZA DEL DESTINO under the baton of Gianandrea Gavazzeni. Other Verdi roles she was admired for at that house were Aida, Amelia IN UN BALLO IN MASCHERA, Elvira in ERNANI, Leonora in IL TROVATORE, and Odabella in ATTILA. She also appeared as a guest artist at the Teatro dell'Opera di Roma, the Teatro di San Carlo, La Fenice, the Teatro Regio di Parma, the Teatro Massimo, the Teatro Regio di Torino, the Teatro Comunale di Bologna, and the Teatro Comunale Giuseppe Verdi. She was a regular performer at the Arena di Verona Festival where she sang in 1968-1969 and 1971-1972. She also made several appearances at the Baths of Caracalla in Rome. On the international stage Orlandi-Malaspina has sung as a guest at the Royal Opera, London, the Bavarian State Opera, the Hamburg State Opera, the Palais Garnier, the Opéra de Nice, the Theatre du Capitole, the Hessisches Staatstheater Wiesbaden, the Liceu, La Monnaie, the Vienna State Opera, the Teatro Colon, the Opéra de Montréal, and the Opera Company of Philadelphia. On 17 October 1968 she made a successful debut at the Metropolitan Opera in New York City as Amelia in Verdi's SIMON BOCCANEGRA with Cornell MacNeil in the title role. She sang several more times with the company over the next 12 years portraying the roles of Elisabetta de Valois in DON CARLO and Aida. Gastone Limarilli was a fine lirico-spinto tenor with tremendous squillo who debuted as Canio at the Teatro Nuovo, Milano, 1959. Later, on 23 Dec., 1959, he debuted at La Scala in Pizetti's FEDRA. These were followed by the Vienna Staatsoper, the Royal Opera at Covent Garden, Monte Carlo, Macerata, the Verona Arena and the Baths of Caracalla. His repertoire was primarily Verdi, Puccini, then Pizzetti, Alfano and Porrino."